Boats approaching the tiny Migingo Islands on Lake Victoria are greeted by the surprising sight of a Ugandan flag flying high above a collection of shiny tin shacks. The three islands are located about two hours by motorboat from the Migori district of western Kenya. According to officials from Uganda and Kenya, it takes at least nine hours by motorboat to reach the islands from Bugiri in Uganda. The two countries have had several conflicts in the past over fishing activities on Lake Victoria. Kenya has always considered the rocky Migingo islands to be part of its territory, and maps dating back to the mid 1950s show them to be in Kenyan territory. But Uganda has recently laid claim to the smallest one, sparking a row between the two neighbours. The one acre island has been home to about 1,000 people from the three East African countries, Kenya, Uganda and Tanzania. Of the three islands, this is the most popular among the fishermen because of its flat, rocky beaches which make it easy to dock boats. But Kenyan boats and fishermen are no longer allowed to land on the disputed island, which is guarded by armed Ugandan policemen. 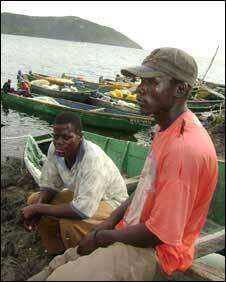 In October, Uganda arrested 15 Kenyan fishermen and ordered about 800 others to leave the island. Now, the country’s flag flies prominently over the island, which acts as a landing port for fishermen on the lake. “The Ugandans came with their flag and hoisted [it] in the Kenyan soil, something that has never happened anywhere in any part of this country,” Kenyan fisherman Ojuku Onyonyi said. He blames a lapse on the part of the Kenyan security system for the dispute. “The Migingo island is in our country. It is in Kenya,” he said. The Ugandan security officers say they will only allow Kenyans back on to the island if they are led by Migori district commissioner Julius Kalonzo. Earlier this month, Mr Kalonzo led a group of angry Kenyan fishermen to the island, where they were greeted by a Ugandan delegation. The two groups held a four-hour meeting but failed to reach an agreement. The two officials addressed the restless crowd of Kenyans which was threatening to pull down the Ugandan flag. “The Kenyan government has spoken to the Ugandan government and said that according to us, Migingo belongs to us,” Mr Kalonzo said. His statement was greeted with loud cheers from the Kenyan fishermen. In contrast, the head of the Ugandan delegation, Bugiri regional district commissioner, Mwanaisha Chikomeko, was heckled by the largely Kenyan crowd. She suggested the formation of a joint beach management committee to oversee fishing on the island as the two countries resolved the dispute. “The chairperson could be a Ugandan, the treasurer could be a Kenyan, the secretary can be a Ugandan, the vice-chair can be a Kenyan, the deputy treasurer should be a Kenyan,” she said. “We’ve already said that harmony means working as brothers and sisters. Be it Ugandan is harassing Kenyan, or be it Kenyan is harassing Ugandan. We want it to stop immediately,” she said. The public meeting ended in disarray, and the two commissioners said the Ugandan flag would continue to fly over the island until the dispute was resolved. 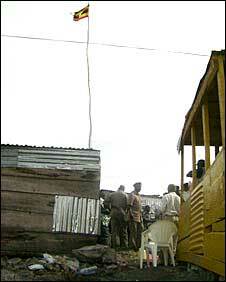 Mr Onyonyi arrived at the meeting carrying a Kenyan flag with him, which he said he intended to hoist on the island. But after the hostile gathering broke up, the fisherman was forced to surrender his flag to the Kenyan security forces who accompanied the district commissioner. The other Kenyan fishermen grumbled but hopped into their boats and sailed off since the Ugandan security forces had cocked their guns to prove that they were still in charge. Since then, the two countries have resolved to engage surveyors to draw up the boundaries and determine who the islands belong to. A joint committee has also been formed to oversee activities on the island and prevent any conflict. wish it was The late founding father of this nation Mzee Jomo Kenyattas Watch This Small pockets of ugandan policemen would have Dissapeared. How can anyone come to your home and Demand for your bed unless you are just there. and a coward Our Leaders once again has failled us. If our leadership fails to secure its citizens from the basic fandamental needs eg. hunger,poverty,security. Whats the point?? kenyanleader ship wakeup wake up what next we will hear somali hoists its flag in Garissa town.Thats what I pay my tax for. Tax for my protection. How can kenya secury forces leave their camps that mutiny they need to be interdicted and a court martial as well as the DC of migori for such a Security laps. how on earth does uganda think the can claim this islan. i am very baffled that kibaki and our security forces have not responded to this aggression from uganda. my take to this fioasco is that our president is compromised as museveni aided hi after the general elections. its a verr dangeraouse and unfortunate tren from museveni cause he wouldnt have dared tried this during Mois tenure. migingo is ours and if the ugandan wont badbe we will not have a repeat of 2007/2008 we will die for our land n thus u should know that we rae quite but the ugandans have to be stopped whether ther region will be unstable enough is enough. this is the time raila should put his foot down , he wasnt elected by us for the saitotie of this world to give reduculouse explanations about it being okay since we are in the east african community.no its not and u will not anex our land n give it to museveni for the support he gave u, otherwise give part of central provice… if museveni is not tamed or stopped the nist thing will be a garand situation in our country and that is when uganda will regreat the day the had this president watch the space.and by the way now that we have our tan kers cab the get ready for deployment this isnt ending soon. I never see wrangle soldiers like mafighter wa knya job yao ni ku shne kiatu kiwi na tumbo bigi barck. warushane vitu. Museveni has lost his plot,he should take his ruggedy flag out of the Kenyan territory and stick it up! way up, where the sun don’t shine,before it gets torned down to shreds and that goes for his Lokoriango Security Misfits too. The Ugandan Scumbugs need to be stopped by any means necessary forget surveying this is a blaitant provocation that calls for military action.its bout time we teach dem a lesson they’ll never forget becoz we are armed and dangerous in the rules of engagement they are no match for us our own Kenyan Soldiers are ready for war ,kwaivyo tuta wa angamiza and Museveni will be history , nough said peace. if it true a kenyan island and it is being guide by armed soilders from Uganda then if means Kenya has no soilders for dawa ya motto ni motto. Let Kenya wake up and fight for their right. You should know who was ruling the Island before the conflict broke out.Otherwise the output will be political disagreement. I don’t know the reason why I am unable to join it. Is there anyone else getting the same RSS problems? Anyone that knows the answer can you kindly respond? Thanx!! The president should just declare war on Uganda to regain migingo.